Most cats would agree that scratching is far less fun than sleeping. If your cat spends more time scratching than taking naps, she probably has dry skin. 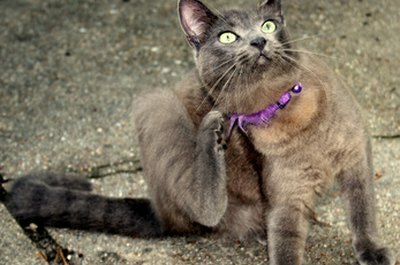 Your cat can blame Mother Nature for most cases of dry skin, but sometimes medical conditions can cause the maddening itching as well. Your vet can help provide your feline friend relief if sprays, supplements and shampoos do not. When your scalp becomes dry, those annoying flakes of dandruff begin littering your hair and shirt. When your cat's skin turns dry, dandruff covers her fur and flakes off when you brush her. In the case of mildly dry skin, you may need to take a brush to her back to see evidence of dandruff. In moderate to severe cases, the white flakes will be evident when you glance at her coat. Dry skin also causes her coat to lose its sheen and appear coarse. All cats sometimes experience itches that need scratching, but if your cat's constantly digging into her skin or licking at areas she can't reach, dry skin is likely the problem. If she suffering from the condition, your cat will look to you for scratching. She'll brush up against you more and appear frozen in place with happiness when you give her a good scratching. If the condition worsens, her skin may appear cracked and red. 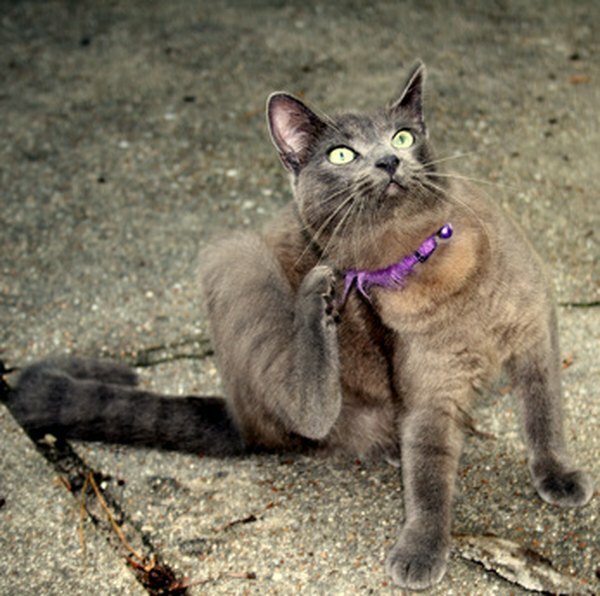 Incessant scratching is also an indication of fleas. A quick comb through your cat's hair for the tiny black parasites will rule out an infestation. If your feline suffers from extremely dry skin, she may inadvertently pull out her own hair from constant scratching and biting. Areas that she can easily reach with her mouth—such as her legs, sides and hips—are most often affected and will likely appear patchy. This usually doesn't happen if your cat has a few flakes and can brush up against your leg to ward off the itch. Dry skin is the harbinger of many medical conditions, but in itself poses no harm to your cat. Dry skin often occurs during winter, when the air is dryer. Moisture sprays, supplements and shampoos all help control dry skin, although your cat probably won't be a fan of anything that requires her to get wet. If your cat continues to experience the skin condition into spring and summer, something else is probably the culprit, such as an allergic reaction. Only an allergy test can confirm what, if anything, your meowing friend is allergic to. For dry skin that occurs during winter, a trip to the vet probably isn't necessary, unless the condition is severe. If it continues all year long or if your cat is plagued by other symptoms, such as lesions, bumps, fatigue or a lack of appetite, only a veterinarian can help your cat return to normal. The aforementioned symptoms always indicate an underlying condition, such as poor nutrition, stress or even a fungal infection.